About me: I am a wife and mother who has loved to sew since about 10 years old. I use to only sew clothes but recently because of all you crafty bloggers I have fallen in love sewing other things like softies, homewares, hats, bags etc. I have only recently started blogging about my crafty adventures but it has blown me away with how friendly the world can be. If you have read my introduction post at the beginning of my blogging life, you would have read how I blog to thank all the craft and sewing blogs out there who have inspired me "sooooo" much and taught me all manner of new skills. Well, I would like to giveaway some of my spare copies of craft magazines I have collected over the years. I will pay all postage costs as well so I will have to limit this first giveaway to "2" overseas winners who will have to pay any associated costs accrued their end, eg: customs if any. The rest of the winners will be chosen from Australia, but only because of costs. I'm sure you are all an understanding bunch of nice readers. 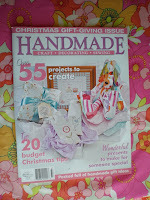 Most of my craft mags are Australian so I am hoping some of you guys don't already have them!! Sorry about the poor quality pictures. I either have a dud camera or am a dud photographer. For quilting fans. I have 3 copies to giveaway. If you know of anyone who likes cross stitch, pass this giveaway on! The puppy dog softie is one of my UFO's. Maybe we can do it together! All you have to do for this giveaway is leave a comment. Also please state which mag you want eg: A, B, C, D, E, F. (Top photo has letters photo-shopped on the front). Also, leave a way for me to contact you regarding addressing info. Names will go into a hat and first winner will have first pick etc. Giveaway closing 15th February 2010. Good luck. Thank you for the opportunity to win in your giveaway! Please stop by and sign up for mine, I am #387 on the carpet ride! E please! I love this giveaway because it keeps on giving! Please put my name in your hat. Hey there! I like D, but the choice wasn't easy! I haven't seen any of them, so they are all new to me! Thanks for the chance!! I would love to win magazine letter 'D'! It looks like it has some great projects in it! Thanks for a fun giveaway! D looks really cool but I havn't seen any of them and would love any! Thanks so much for stopping by my blog and becoming a follower. You are my very first (unless my sister who visits anonymously counts!) Please enter me in your giveaway. And thanks again for stopping by. What a terrific idea! I would like either D or E! Thanks for also stopping by my giveaway earlier. Oh wonderful craft magazines! I would be happy to win any of them! this is fun! super giveaway! would love to win! please enter my name in your drawing. What a wonderful blog! Please sign me up for your marvelous drawing and then come visit me...I am participating in OWOH too...number 333 on the Magic Carpet! I am off to read more on your blog and I am looking forward to it! i'd love to be the proud owner of these! Maybe I would learn to quilt? I would love to get my hands on that cross-stitch mag though. I could be very happy reading those magazines! Very generous give away. I would enjoy either E or D. Thanks for the very generous giveaway. I don't have any Aussie magazines and would love to win these. 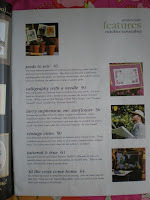 I do love a good craft magazine...always looking for new ideas! Thank you for stopping by my blog, come back anytime. 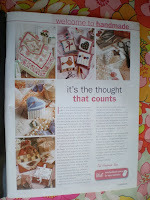 Oh, I love craft magazines! Plz put me down for D or E or any of them! Thank you for stopping by my blog! Looks like we have a lot in common! OH I would love E.
I would love to win the 'handmade' magazine. I know it would be interesting to read. Thank you. I love crafty magazines! 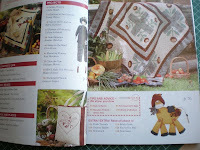 Even though I have a bunch of quilting mags already, I cannot resist throwing my name in the hat for B! Wondeful magazines, I would love to win these, thanks for comment on my giveaway. Wow, I'm in love. Please send mine in a plain brown wrapper (grin). I'm #79 on the magic carpet journey. Thank you for a chance to win such a great offering!! 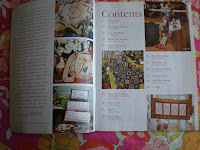 I'm lovin' on craft magazines!!!! Thank you for the opportunity! Thanks for visiting my blog! Very nice! Please add me!I dont have a giveaway this year, but please stop by my blog!~~ Becky.Im a dud when it comes to photography as well LOL. Oh I love these magazines! I only have a few and I so enjoy their beautiful projects! Please enter me into your wonderful drawing. Thank you. Gorgeous giveaway!!! !I'd love to have these magazines! Lovely mags, I would be pleased with any, thanks for the chance to win. Pop over to my blog and enter mine. I love magazines! Thanks for the chance to win! WOW! I´m a magazine freak, I love this opportunity to win these magazines so please count me in to your draw! Great idea! Susan from Sweden, nr 821 on the Magic carpet. 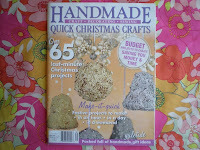 oooh i love crafting magazines - where better (other than blogs of course) to get inspiration! PLease count me in - i would LOVE A :) thank you! Please PICK ME to win in your giveaway drawing! thank you. I will back to visit after the event. Hope the magazine B comes on a magic carpet to me, here in the USA! What a clever giveaway to share ideas! Hmmm. I guess A or B as I'm a quilter more than anything else. :-) So nice to meet you and see your blog! Since I'm part of OPAM, guess I'll be seeing more of you this year. Oh! and thanks for flying by to visit me. Thank you for participating in this year's OWOH event. I am so delighted you are in Australia, each year as this event has grown there has always been a huge showing from your country. I love it!!! 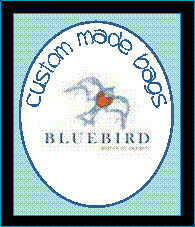 Little by little I am trying to get back to blogs to comment. I would be honored to enter your giveaway. this looks like hours of fun! I would really love these magazines - send them my way please! I love magazines! I think I would like D the most, but any would be cool! Thanks for stopping by my blog, love your softies! 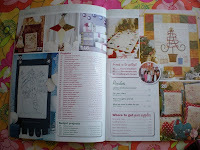 Love craft magazines!!! Any and all!!! I would love to be the winner! Please include me and come on over and enter my giveaway too! Hi, My name is Sue Niven and i am one of your swap group partners. I am looking forward to reading your blog and getting to know you better. I understand you like blue, aqua, pink and red. what a great giveaway.the one labeled "D" looks interesting. thanks so much for the opportunity to enter the drawing. so delighted to meet you through this event. I hope you'll stop by my blog as well. What a wonderful give away - who would not want all the magazines. Please enter me and thank you so much for stopping by my blog. Yes please--I would love to win either D or E.
Hi Antmee, what a lovely idea and post you have. I love the craft magazines. I'd love to win. I absolutely love your gifts. Please take time to visit my blog, too, for a chance to win my book, 16 x MOM: A Mastery of Motherhood. I'm working on getting all the country flags. I promise to revisit your's too. 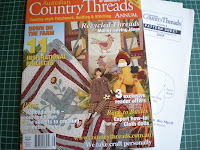 Please sign me up to win your magazine collection I have many Australian Smocking and Embroidery books and Inspirations (from Australia) which are for embroidery and needlework- if the crafting magazines are anything like the needlearts magazines, I will be thrilled!!! Hello from Oregon in the U.S.! What a great idea for your giveaway. Craft mags from Australia. I'm drooling! I would be happy to have any of them, but my first choice would be Mag F.
Thanks so much for stopping by my blog on your magic carpet ride today! 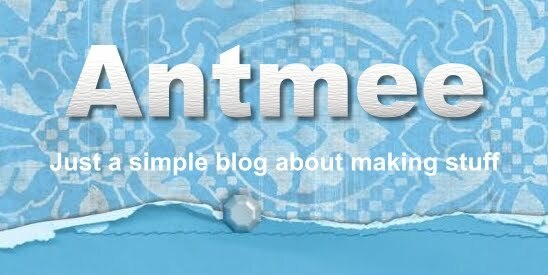 Nice to meet you and visit your blog! Love this giveaway! I am having so much fun looking at all the wonderful blogs. I don't have a blog, due to arthritis I cannot type much at all but I enjoy surfing the net. Thank you for a chance to win. I'd love to win that Country one! 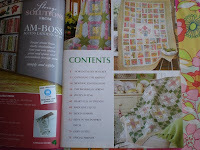 I love to quilt so any patchwork magazine would be just great! I love to quilt so I would love the patchwork mags. Sorry about the double posting. Please delete one. Thank you! 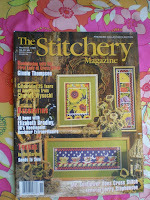 you can never have too many craft magazines... lol Great giveaway! 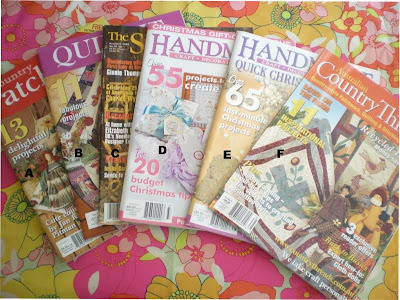 I love Australian quilt magazines so either the Country Threads of the last on called Hand Made would be wonderful to win. Recently when I won a different magazine,I did not pay any customs on it. It was listed as a gift on the customs form. I hope you have a fun time visiting the many blogs of OWOH. yesss i like craft magazines. Maybe i will win, yes put me name in the hat please. One can never have too many craft magazines!! Thanks for an enchanting stop on the magic carpet! I am having so much fun riding the magic carpet, hope you are too! Love your giveaway (d or e would be my preference) please enter my name and stop by mine when you get a chance - #234. Cool mags would love to check them out, please count me in. When you get some time, fly by my blog on your magic carpet, I am OWOH #907. Thank you for participating in OWOH. It is very very nice to meet you. I love your magazine giveaway. I'm a true magazine junkie & would love to add more to my neverending collection. Thank you for flying over my blog and leaving your kind comment! 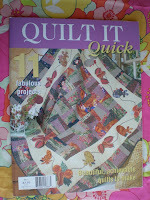 Please count me in... Love quilting! What a fabulous giveaway. It was so hard to decide which one, but I pick 'E'. Please enter my name, thank you. I would love E or maybe C.... ahhh! E! I would love the magazines. It was be so neat to see what are in them! Please enter me! Charming and a beautiful blog with a stunning treasure! D or E for me!! My first year with OWOH and I love visiting all the amazing blogs! I am flying on my magic carpet ,visiting from Connecticut. This is one delightful give away! You are so kind to share!!! I love my craft mags too. I 'd prefer D,E or F.
Hi Kylie, thanks for stopping by Grace Goods for my OWOH giveaway! Oh, I just L-O-V-E magazines! Please add my name to your drawing! Isn't this a fun trip? There is so much eye candy to see! Your giveaway is heavenly! Stop by my blog at #922 to enter my giveaway. Well, this would just be super-fun to win! A whole library of creativity! You are most welcome to visit my blog and giveaway. Have a nice day! Oh wow... what a wonderful giveaway! I would have to say that "F" would be the magazine I have my eye on the most. Oh, and what a wonderful blog you have too! Please enter my name into your fabulous drawing for a chance to win. Let's continue the ride on the magic carpet! I have enjoyed Australian magazines over the years but have not had any for a long while. Fun prizes. FABULOUS Offerings!! Please enter my name in your drawing :) What a FUN event...enjoy the ride!! Wonderful giveaway! If I won, I'd pick either D, E or F.
Hello from the north of 60°! Are you enjoying ride on the Magic Carpet through the Blogland? I do! Please enter my name in your draw. This is a GREAT giveaway! Nothing better than inspiration! Please, count me in too! What an awesome giveaway! I would love to win. Thank you for participating in OWOH. And for your giveaway. I actually have 2 giveaways at my blog, the OWOH one and a bonus giveaway. Feel free to enter both. Christina from Manila, Philippines here! I hope you can also drop by #615! What a great gift!! I would love to win (and just so happens I don't own any of these! ), please enter my name into your drawing! And if you haven't already, please enter mine #135 to win 1 of 3 prizes!!! 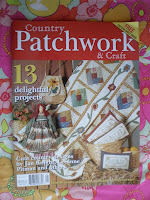 Enchanting Craft Magazine OWOH Giveaways! What a generous giveaway! Please enter me in your drawing. Thanks for the opportunity to win such lovely prizes! I would love to see magazines from another country! Please count me in! The Christmas projects (E) are surely great! :) Thanks for the chance to win one of the magazines. Hi from England! I'd love to be included in your giveaway, and magazine 'D' should I be lucky enough to win, thank you. If you haven't already, please visit my blog at #711 on the magic carpet to win a designer Cath Kidston bag, handmade by me! Please enter me for the lovely OHOW giveaway! I would love to win! Ooh, I love looking through these kinds of magazines for ideas and inspiration. Count me in. I'm so happy that OWOH brought me to your blog! I'd love to be entered in your giveaway. My choice would have to be D, but then again, I'd be happy with either! I'd love to win! I'm so happy to be participating in the OWOH and get the chance to meet all you wonderful peeps! thanks #690 fly on over. Australian craft magazines have a good reputation and I don't have any! Thanks for counting me in! If you have a chance, stop by to see my blog and enter my giveaway. #94 on the Magic Carpet. There's still time! I love inspirational magazines! Please enter my name in your drawing. Thanks! Would love to win your giveaway, if I am not too late. Thanks for the chance. I'd love for you to stop by and visit my blog and enter my giveaway if you have time. Closes at 12 noon Feb 15th. Psst! A friend is having a bag giveaway!